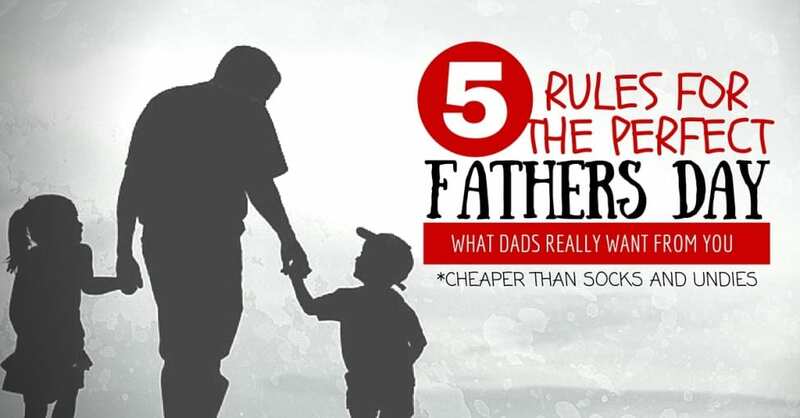 Cheaper than socks and more thoughtful than booze, here are some rules for making the best father’s day ever from a father of 5 (nearly 6). As dads, we are very aware of the value of money, we get weird when money is spent on anything that’s not essential. ​No dad, no matter their age, believes he’s any older than his early 20’s. Do something physical like playing tag (if you're young), going to your gym (if you're older), riding a bike orkicking a football. Whatever it is, please, do it with us. We want to have fun with you. ​We have everything we need. We will one day have everything we want, but not before we’ve given you everything you want. All a dad really wants is a lasting memory with you. Make a memory, make it an experience. ​If you absolutely have to buy something, tie it to an experience. We won't remember the gift you gave us, unless it triggers a memory. A good example would be to give Dad a hat, then go for a walk in the wilderness so he can wear it... Every time he sees the hat after that, he'll remember that walk with you. ​My eldest son mowed the lawns for me once, and I still remember it as the most generous gift. All that spare time, no money wasted… dad-bliss. Every time I go out and mow the lawn now, I think about how kind that was. Making dads coffee for him, the way he likes it, and bringing it to him? ​We know you love us, but tell us why. We don't need you to massage our egos with compliments every day, in fact we'd prefer you didn't push any mushy stuff onto us. But once a year, lay it on thick. Be specific and sincere and you’re guaranteed to see your old man get a bit of dust in his eyes and a frog in his throat. If you can't be there to take a job off his hands, and you really want to buy something, why not make it something life changing, something he's always wanted to do. If he's always wanted to write a book, check out James Patterson teaches writing. If he's into acting, ​check out Dustin Hoffman's acting course. Character driven, not behaviour driven. How far would you run for your favourite food?